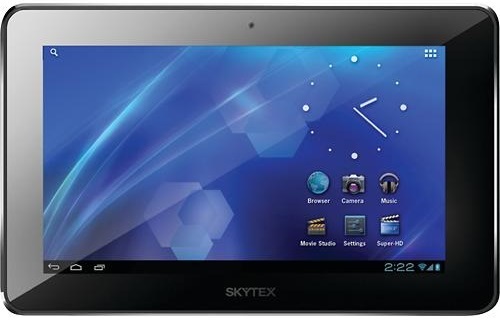 Skytex is one of the many small gadget makers that first got into ereaders in 2010 and then quickly got out of that market and into tablets. They have produced many Android devices over the past 3 years, both good and bad, and the Skypad SP458 definitely falls into the latter category. Opinion: Run Away! Run Away! I bought this tablet by mistake, and I plan to return it post haste. After having used it for a few days I don't see any reason to recommend it; in fact, I am having trouble getting it to do anything at all. But since I do have it in my hands I decided to post a short review. Cost - At $49, this would have made a nifty PDA if not for the many cons. When I saw the listing for the Skypad SP458 on the Best Buy website, It looked like an awesome deal for a $50 device. BB said that this tablet had a low resolution screen and a limited amount of RAM, but on the upside it was also supposed to have a dual-core 1.6GHz CPU with a 2MP camera, 8GB internal storage, and adequate storage. Unfortunately only about half of the listed specs were accurate - and it wasn't the better half. This device has the specs and performance of a tablet with cheap components and a single core CPU. Don't buy it. Pretty much any device with a dual-core CPU is going to offer a better value, and chances are you will find a slightly better tablet for $70 to $80. They're worth the extra cost, trust me. The Skypad SP458 runs Android 4.1 on a cheap single core 1GHz CPU with a mere 353MB RAM. It has 5GB (ish) internal storage, a microSD card slot, Wifi, and a single speaker on the back. In terms of ports it has a headphone jack and a microUSB port. There are two cameras, both with a VGA resolution. At first glance this is a nice device. The general build quality is good, and thanks to its 4.3" screen it has a svelte size which can be easily gripped in one hand. All of the ports and the card sot are on one end, along with the power button. The volume keys and the back button are clustered at one end of a long edge, well placed to have the volume buttons under my forefinger. But when I turn it on I notice that the Skypad SP458 is painful to use. The screen hurts my eyes, and when I try to type using the onscreen keyboard I am reminded why I don't have a smartphone or iPod Touch. The tiny screen makes it difficult for me to type with my thick fingers. And then I tried to run apps. The Skypad SP458 scored 4672 on the Antutu test. That is about what I would expect from an Android tablet with a single core CPU, and I have found such tablets to be usable. But this device doesn't have a performance to match even its limited test score. Thanks to the limited RAM, the Skypad SP458 has trouble running more than one app at a time. For example, when I tried to run the Kindle app, I still had the Antutu benchmarking app sitting in the background, so both apps had to share the limited RAM. The Kindle app did eventually load, but it took several tries before I could even get as far as logging in. Your best bet is to hope that one app will crash when you're not using it, leaving the limited RAM for the use of the other app. And god help you if you want to watch a movie or run a resource intensive app. Speaking of apps, the Skypad SP458 has Google Play. It actually ships with 3 app stores, but since it has Google Play I didn't see a need to try 1Mobile market or the Skytex app store. In addition to the stock email, web browser, gallery, and calendar apps, there are also quite a few "Get app" installer app placeholders. Youtube, Angry Birds Adobe Flash Player, and Facebook as well as a half dozen Spanish language apps all have to be downloaded before you can use them. I wonder why? Youtube and Facebook both installed okay, so it's not really an issue, but I do find it strange that the apps weren't included in the first place. I haven't tried to watch a movie, but I did stream a video from Youtube. The Youtube app was slow to initially load the video, but much to my surprise, the video played. It frequently paused so that more of the video could be loaded into the buffer, but it played. The audio was exceedingly quiet; at first I thought the sound was turned off or the speaker was broken, but nope. It's just a very weak speaker. I decided to get this tablet more out of a sense of nostalgia than anything. It was about 3 years ago that I picked up an earlier version of this tablet. That device carried the Ematic brand, It turned out to be junk, but I was hopeful that the quality had improved over the past 3 years. Nope. Would probably be faster if it didn’t run Android. A pity that it doesn’t seem to be available in Europe. Could be a fun gadget to hack.